These powerful compounds may help prevent CVD and cancer and boost cognitive function. Many dietitians are well aware of the benefits fruits and vegetables provide, but few may know the actual names and types of the disease-fighting compounds they contain that are so important for good health. Anthocyanins are plentiful in plant foods, providing the bright red-orange to blue-violet colors of many fruits and vegetables. These compounds occur naturally in plants in the form of glycosides, in which an anthocyanidin molecule is paired with a sugar. The part of the pigment that exists free of sugar (generically known as aglycone) is called an anthocyanidin.3 These compounds are most abundant in berries (eg, black currants, elderberries, blueberries, strawberries) and their juices, and in red and purple grapes, red wine, sweet cherries, eggplants, black plums, blood oranges, and red cabbage. Plants produce anthocyanins as a protective mechanism against environmental stressors, such as ultraviolet light, cold temperatures, and drought. This production of anthocyanins in roots, stems, and especially leaf tissues is believed to provide resistance against these environmental hazards. While the answers to how and why anthocyanins may help prevent disease remain undiscovered or unexplained, the literature to date is intriguing, and most researchers are calling for more studies to explore the potential health benefits of these naturally occurring compounds. “While one could argue that the evidence is inadequate to define a specific dietary recommendation, it’s clear that consuming anthocyanin-rich foods should be encouraged,” says Jeffrey Blumberg, PhD, director of the antioxidants research laboratory at the Jean Mayer USDA Human Nutrition Research Center on Aging at Tufts University in Boston. Another study that assessed the effect of anthocyanins on health followed 87,242 women from the Nurses’ Health Study II; 46,672 women from the Nurses’ Health Study I; and 23,043 men from the Health Professionals Follow-Up Study for 14 years.8 Researchers found that those in the highest quintile of anthocyanin intake (mostly from blueberries and strawberries) had a significant 8% decreased risk in developing hypertension compared with those in the lowest quintile of anthocyanin intake. The risk reduction was even greater (12%) for those aged 60 or younger and, for all subjects, the decreased risk remained even after controlling for a large number of factors, including family history, physical activity, BMI, and other dietary factors associated with hypertension. A larger group of 93,600 healthy women from the Nurses’ Health Study II was followed for 18 years; a high intake of anthocyanins was associated with a significant reduction in the risk of myocardial infarction.9 Specifically, those consuming more than three servings of blueberries and strawberries per week had a 34% lower risk compared with those who consumed fewer. The decreased risk of CVD may be due, in part, to a reduction in arterial stiffness and blood pressure.10 Arterial stiffness is assessed based on the structure and function of arteries, and central systolic blood pressure is a strong predictor of atherosclerosis and the incidence of CVD. However, in a study of 25 colon cancer patients who received 60 g/day of an anthocyanin-rich black raspberry powder for two to four weeks, the tumors had reduced proliferation rates and increased apoptosis.22 Another study of 25 colorectal cancer patients given 0.5 to 2 g/day of anthocyanins as a bilberry extract for seven days, found an improvement in several changes consistent with colorectal cancer chemoprevention.23 Paradoxically, the smallest dose of 0.5 g/day was most beneficial. The authors of a recent review on the subject suggested that the consumption of flavonoid-rich fruits such as berries, apples, and citrus throughout life potentially could limit or even reverse age-dependent deteriorations in memory and cognition. As of now, however, there are no human studies to prove a causal relationship between the consumption of anthocyanins, or any flavonoid, and cognitive functioning. Whether the consumption of flavonoid-rich foods can have a beneficial effect on cognition also may depend on when in life exposure occurs. The effects of anthocyanins are closely linked to their absorption and metabolism, but more research is needed to better understand how they’re absorbed and used in the body before anthocyanin doses can be prescribed for disease prevention. While Blumberg admits that the medical community has limited knowledge of the mechanisms of action and health benefits of anthocyanins, he questions the wisdom of waiting for definitive research when clients may benefit from increased consumption of anthocyanin-rich foods now. 1. Wallace TC. Anthocyanins in cardiovascular disease. Adv Nutr. 2011;2:1-7. 2. Roy HJ, Lundy S, Eriksen C, Kalicki B. Anthocyanins. Pennington Nutrition Series. http://www.pbrc.edu/training-and-education/pdf/pns/pns_anthocyanins.pdf. 2009. 3. Tsuda T. Dietary anthocyanin-rich plants: biochemical basis and recent progress in health benefits studies. Mol Nutr Food Res. 2012;56(1):159-170. 4. Hidalgo M, Martin-Santamaria S, Recio I, et al. Potential anti-inflammatory, anti-adhesive, anti/estrogenic, and angiotensin-converting enzyme inhibitory activities of anthocyanins and their gut metabolites. Genes Nutr. 2012;7(2):295-306. 5. Wu X, Beecher GR, Holden JM, Haytowitz DB, Gebhardt SE, Prior RL. Concentrations of anthocyanins in common foods in the United States and estimation of normal consumption. J Agric Food Chem. 2006;54(11):4069-4075. 6. Mink PJ, Scrafford CG, Barraj LM, et al. Flavonoid intake and cardiovascular disease mortality: a prospective study in postmenopausal women. Am J Clin Nutr. 2007;85(3):895-909. 7. Rimm EB, Giovannucci EL, Willett WC, et al. Prospective study of alcohol consumption and risk of coronary disease in men. Lancet. 1991;338(8765):739-742. 8. Cassidy A, O’Reilly EJ, Kay C, et al. Habitual intake of flavonoid subclasses and incident hypertension in adults. Am J Clin Nutr. 2011;93(2):338-347. 9. Cassidy A, Mukamal KJ, Liu L, Franz M, Eliassen AH, Rimm EB. High anthocyanin intake is associated with a reduced risk of myocardial infarction in young and middle-aged women. Circulation. 2013;127(2):188-196. 10. Jennings A, Welch AA, Fairweather-Tait SJ, et al. Higher anthocyanin intake is associated with lower arterial stiffness and central blood pressure in women. Am J Clin Nutr. 2012;96(4):781-788. 11. Chiva-Blanch G, Arranz S, Lamuela-Raventos RM, Estruch R. Effects of wine, alcohol and polyphenols on cardiovascular disease risk factors: evidences from human studies. Alcohol Alcohol. 2013;48(3):270-277. 12. Jin Y, Alimbetov D, George T, Gordon MH, Lovegrove JA. A randomised trial to investigate the effects of acute consumption of a blackcurrant juice drink on markers of vascular reactivity and bioavailability of anthocyanins in human subjects. Eur J Clin Nutr. 2011;65(7):849-856. 13. Giordano L, Coletta W, Tamburrelli C, et al. Four-week ingestion of blood orange juice results in measurable anthocyanin urinary levels but does not affect cellular markers related to cardiovascular risk: a randomized cross-over study in healthy volunteers. Eur J Nutr. 2012;51(5):541-548. 14. Sankhari JM, Thunaojam MC, Jadeja RN, Devkar RV, Ramachandran AV. Anthocyanin-rich red cabbage (Brassica oleracea L.) extract attenuates cardiac and hepatic oxidative stress in rats fed an atherogenic diet. J Sci Food Agric. 2012;92(8):1688-1693. 15. Graf D, Seifert S, Jaudszus A, Bub A, Watzl B. Anthocyanin-rich juice lowers serum cholesterol, leptin, and resistin and improves plasma fatty acid composition in Fischer rats. PLoS One. 2013;8(6):e66690. doi:10.1371/journal.pone.0066690. 16. Wang LS, Stoner GD. 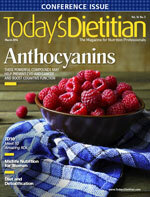 Anthocyanins and their role in cancer prevention. Cancer Lett. 2008;269(2):281-290. 17. Wang LS, Hecht SS, Carmelia SG, et al. Anthocyanins in black raspberries prevent esophageal tumors in rats. Cancer Prev Res (Phila). 2009;2(1):84-93. 18. Lim S, Xu J, Kim J, et al. Role of anthocyanin-enriched purple-fleshed sweet potato p40 in colorectal cancer prevention. Mol Nutr Food Res. 2013;57(11):1908-1917. 19. Rossi M, Garavello W, Talamini R, et al. Flavonoids and the risk of oral and pharyngeal cancer: a case-control study from Italy. Cancer Epidemiol Biomarkers Prev. 2007;16(8):1621-1625. 20. Bosetti C, Bravi F, Talamini R, et al. Flavonoids and prostate cancer risk: a study in Italy. Nutr Cancer. 2006;56(2):123-127. 21. Bode U, Hasan C, Hulsmann B, Fleischhack G. Recancostat compositum therapy does not prevent tumor progression in young cancer patients. Klin Padiatr. 1999; 211(4):353-355. 22. Wang LS, Sardo C, Rocha CM, et al. Effect of freeze-dried black raspberries on human colorectal cancer lesions. Presented at: AACR Special Conference in Cancer Research: Advances in Colon Cancer Research; November 14-17, 2007; Cambridge, MA. 23. Thomasset S, Berry DP, Cai H, et al. Pilot study of oral anthocyanins for colorectal cancer chemoprevention. Cancer Prev Res (Phila). 2009;2(7):625–633. 24. Spencer JP. The impact of fruit flavonoids on memory and cognition. Br J Nutr. 2010;104 Suppl 3:S40-S47. 25. Youdim KA, Shukitt-Hale B, Joseph JA. Flavonoids and the brain: interactions at the blood-brain barrier and their physiological effects on the central nervous system. Free Radic Biol Med. 2004;37(11):1683-1693.